The 82-year-old Tibetan spiritual leader met with Obama at a New Delhi hotel on Friday morning. He later shared a photograph on Twitter showing the two men in mid-discussion. As CNN noted, the meeting marked the sixth time the Dalai Lama and Obama, both Nobel Peace Prize laureates, have met in person. They last met at the White House in June 2016 when Obama was still president. Kasur Tempa Tsering, a representative for the Dalai Lama, said the two men “dwelled on various topics pertaining to promoting peace in today’s world torn by strife and violence” during their 45-minute meeting. (Original Caption) 10/8/1952-Lhasa, Tibet- Panchen Ngoerhtehni, also known as the Panchen Lama, is shown(left) with the Dalai Lama, boy spiritual leader of Tibet, when they met shortly after the Panchen's arrival in Lhasa, capital of Communist-controlled Tibet. This picture is something of a photographic rarity in that it is probably the first time the two Lamas have been photographed together. Archbishop Desmond Tutu shares a joke with the Dalai Lama after their meeting, August 21. The Dalai Lama is in the country on a short visit, the first by the Bhuddist leader. The Dalai Lama (L) prepares the sand mandala, a colour sand picture which will be completed over the nine days of the Kalachakra, September 20, a Buddhist ceremony for world peace which begins in Sydney on September 21. The mandala is painted with fine sands made from soft, white Himalayan stone crushed and then dyed with fourteen brilliant colours. “To Obama, His Holiness said, ’You are not only a former US president but you are a Nobel laureate, you are young and you can do a lot. We should fulfil our aspiration for world peace. Maybe my generation will not see the results, but your generation will definitely see the results,” Tsering said. The meeting comes about two months after the Dalai Lama expressed concern about the U.S. becoming more “selfish” and “nationalist” under President Donald Trump. “The present president, in the very beginning he mentioned ‘America first.’ That sounded in my ear not very nice,” he said at a conference in October, according to the Washington Post. Obama concluded a five-day world tour on Saturday, which included stops in China, India and France. Other than his meeting with the Dalai Lama, Obama also met with Indian Prime Minister Narendra Modi and appeared at a leadership summit hosted by the Hindustan Times. At the summit, Obama appeared to take a dig at Trump while discussing social media. 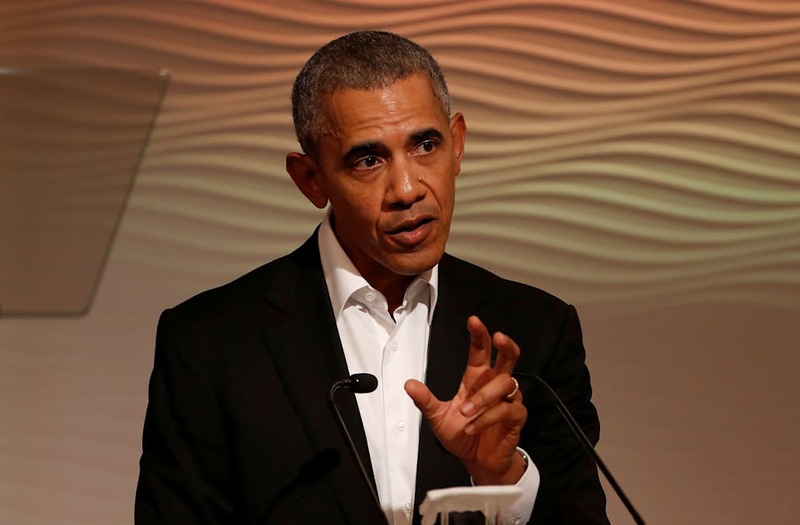 “I actually have more [Twitter followers] than other people who use it more often,” Obama said, prompting laughter from the audience who viewed the comment as a a jibe against Trump. (Obama has 97.4 million followers on Twitter; Trump has 43.8 million).